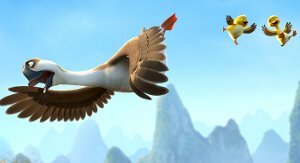 In this animated film we follow Peng, who is a free-wheeling bachelor goose who’d rather do anything than practice for the upcoming migration. He thinks he’s better than everyone else and spends his time attempting crazy stunts at even crazier speeds. In one such stunt, he flies too near the ground, hits a flock of ducklings and separates a brother and sister from the rest. 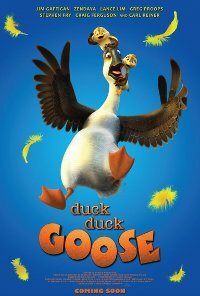 In this unlikely meeting, he will begin a journey that will break his wing and nearly break his heart as he grows to understand the power of unconditional love in the form of two ducklings, who likewise grow to see him as the best father they could ever have. I thought YOU packed the parachute! Language Isolated instances of very low impact, naughty rather than crude words. Violence Low impact, unrealistic, comedic violence that occurs fairly frequently with humour and fantasy mitigating the impact. Violence does not result in any lasting harm to any character, or in any blood-letting.